Le Jardin Rosa Mir, or the Rosa Mir Garden, located in the heart of Croix-Rousse in Lyon’s 4th arrondissement, is one of Lyon’s unique treasures, founded in the dreams of a self-taught artist. The Rosa Mir Garden is a small, originally private garden located in the courtyard of an apartment building. Created between the years of 1957 and 1977, the garden is a tribute to the creativity and artistic vision of its creator, a Spanish mason called Jules Senis Mir. The Rosa Mir Garden sits in the heart of Croix-Rousse in Lyon’s 4th district. Made up of pillars, basins, obelisks and pergolas sculpted from pebbles and shells, the monument pulls its inspiration from Arab-Andalusian motifs and styles. It is filled with over 10,000 plants, from cacti to perennials to roses to oregano and lemon. Jules Senis Mir came to Lyon with his wife and two children in 1951. However, the next year began a long stay at the Edouard Herriot hospital for throat cancer treatment. When he finally recovered, Mir decided to buy the plot of land adjacent to his apartment at 83 Grande Rue de la Croix-Rousse to create a garden. He dedicated it to his mother and the Virgin Mary, believing that he owed his recovery to her. His mother’s name, Rosa Mir Mercader, is engraved in the stone next to the entryway, and a corner of the garden reveals a statue of the Notre Dame de Lourdes in honor of the Virgin Mary. 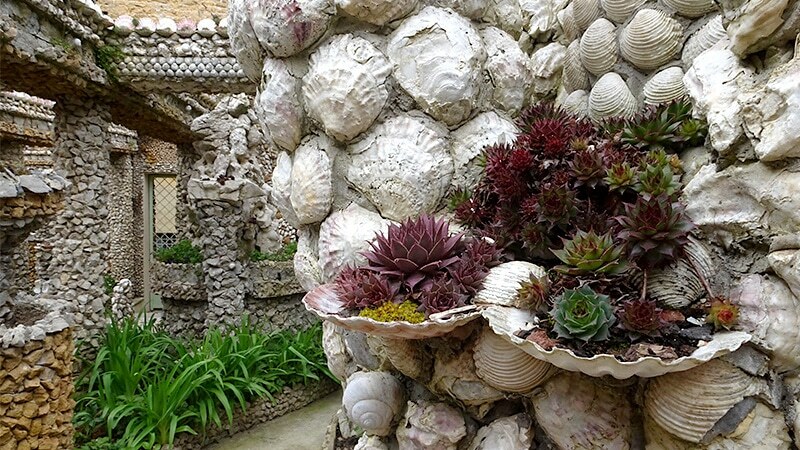 The garden itself is made up of materials gathered gradually, including pebbles from rivers, stones from building sites, the shells of shellfish from restaurants, all mixed with seashells brought back from around the world by friends on their travels. The garden was built using a combination of pebbles, stones, and shells. Mir was a true self-taught artist, following no plans in his creation. Instead he went off the vision in his head, building his creation over the course of 20 years and affectionately nicknaming it “le petit caillou,” or the little pebble. Finished in 1977, the garden had gradually fallen into ruin over the years due to its fragile base materials. In September of 2015, the city of Lyon launched a restoration project to last 10 months. It was reopened in June of 2016 and is open seasonally from April to October each year. Because Mir didn’t work from plans, he also left no record of what kind of plants he wanted his garden to include. The garden’s structure varies from narrow pergolas and shallow shell structures to basins and large flowerbeds, making it suited to many different kinds of plants. Visitors are invited to scale the metal spiral staircase to the upper deck, which provides a view on the garden below. From above, viewers can clearly see the upper basins, filled with 450 plants like agave and yucca that enjoy a lot of sun, and the shell-covered pergolas holding 4000 cacti and other airy plants. Down below, visitors enter through a main pathway, bordered on either side by the columns of a pergola. To the left is the tribute to the Virgin Mary, along with a massive obelisk filled with compact plants perfect for the structure’s shallow spaces. Across the way is a stone wall plastered with rows of pastel pink shells, hidden behind a towering rock tree sculpture, its foliage made up of the same shallow plants that fill the obelisk. The rock tree sculpture has shells as plant holders, so the plants needed to be shallow and airy. Shaded basins hold 750 perennials, and the wall planters crawl with over 2000 bellflowers, impatiens, cloves, and other seedlings nestled between the stones. The flowerbeds, meanwhile, get a mixture of sun and shade and are perfect for their 5000 perennials that include oregano, roses, iris and, Mir’s favorite, a lemon tree. 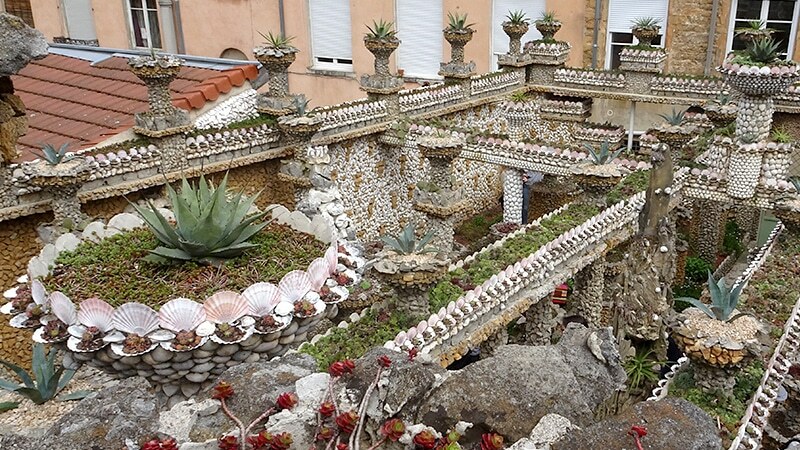 The Rosa Mir Garden is reminiscent of other monuments of amateur architecture, like the Palais Idéal du Facteur Cheval in the Drôme just outside of Lyon. Both pieces are a part of a movement of untrained eyes and artistic vision. 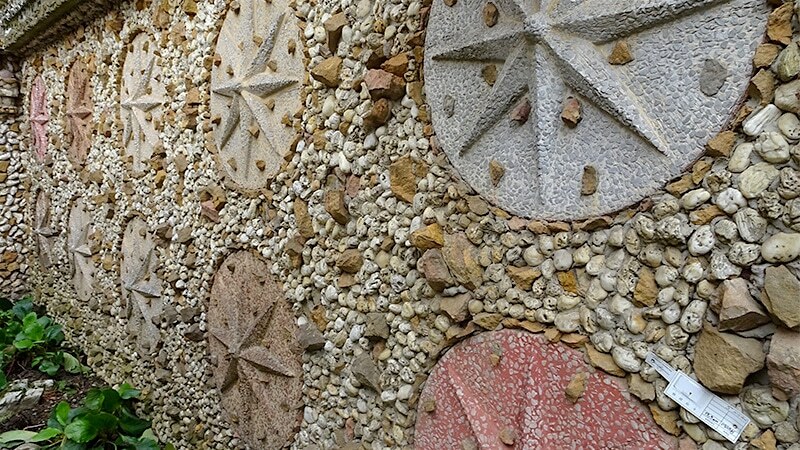 Taken altogether, the Rosa Mir Garden is a showcase of years of work and thousands of pebbles, shells, and stones. Hidden in its private courtyard, it’s an odd Lyonnais treasure that the public would not normally get to witness. Tip 1: Because of its size only 15 people can enter the garden at one time. Get there at the beginning of visiting hours on Saturday to avoid waiting in line. Tip 2: Looking for more Jules Senir Mir artwork? He also did the façade of a building at 7 rue d’Austerlitz, a 10-minute walk from the garden, in a similar stone-and-pebble style.